Save-the-Dates, bridal shower and rehearsal dinner invites, wedding invitation suites, programs, table numbers, and menus are just a few of the items on your to-do list, right? That means you're in the market for a kickass graphic designer for your big day, and we've got you covered with two of our favorite wedding stationery experts. Sarah Meyer from Designs by Sarah and Carina Herman from LBC Design Co. came together with your Denver wedding planner Blue Linden to answer some questions, give some tips, and show examples of the amazing work you can expect from graphic designers like them. I had been working as a professional graphic designer/art director for about 12 years - providing graphics support for such large companies as Golfweek Magazine, the New York Stock Exchange, Nine West, Anne Klein, and Citi Group. When I experienced the major lifestyle change of moving from New York to Colorado, it gave me the courage to leave the corporate life behind and re-create myself as an independent graphic artist. Now, I want to assist couples and families in finding creative answers for those special occasions, like a wedding day and the celebrations surrounding it. What is your ideal 'first client interaction' like? My ideal clients, and people in general, are positive and energetic souls. They are passionate and curious about life. They enjoy collaboration, are open-minded and creative in their decision-making process. When searching through wedding stationery experts, what things should clients look for, ask, and expect? - Connecting with the artist's work is most important. Look at portfolios and select a designer whose style is in sync with your own. If you can't find a portfolio, contact them and ask for samples of their work. - For something as personal as a wedding invitation, designers should want to meet you face-to-face (if possible). If you are working with them remotely, they should be calling you for that initial consultation. - Ask TONS of questions! I love questions because it makes me feel like the client is really involved. - If you have your heart set on custom designed invitations, expect to pay more than the pricing you find on places like Minted or Etsy. A designer sources everything for you—from selecting the right printer for the job, to ordering paper and envelopes, to researching stock art and custom fonts. I can easily spend 40-60 hours on a custom wedding invitation suite from start to finish - and a designer's time is worth something just like a plumber's, lawyer's (or a planner's) time. What gives you inspiration to create something unique for each individual client? Weddings are a story of two people. I like to be a part of the collaboration between them, to see the two individuals make decisions together, as one. Everything about the wedding invitation speaks to the couple getting married -the tone of voice in the copy, the font, the color scheme, etc. All of those are a creative expression of them and their relationship, which is one-of-a-kind. The decisions made on the wedding stationery can help maintain continuity throughout the wedding theme. My creative process starts and ends with my clients. There is a saying that "an artist is only as good as his/her tools". I rely on my clients to give me the tools to create. They inspire me! Then, I look at other artist's work to push me in a certain direction. Sometimes I create five designs in a day, and other times I barely finish one. There is also the printing/production side of the project that you cannot ignore. The vision doesn't always translate onto the paper the way you think it will, so I lean on my printers for guidance. With each and every project, the creative road to the finished product is never the same and I enjoy that thoroughly. How much time do you need from start to delivery of completed work? For a wedding invitation suite I recommend 2 months. It is, hands down, the most time consuming paper good I work on. I always do a "kick-off" meeting with my clients to discuss, not only the timeline, but likes, dislikes, tone of voice, imagery, fonts, etc. I provide all of my clients (who hire me for custom work) with two design concepts to select from. With that in mind, I usually require about 2 weeks to create their designs. Once a design is selected, then we go through revisions and decisions on paper, envelopes, invite enclosures, ink colors, etc. Print production can be anywhere from two days to four weeks, depending on the complexity of the project and the printing techniques involved. What makes you stand apart from others in your craft? My 10+ years of professional graphic design experience is what gives me an edge above the rest. My first job out of college was as a Pre-Press graphic designer in a print shop. I didn't design anything - I learned how the printing press worked and set up files for the jobs going to print. I worked on Wall Street and the Fashion District in NYC where the marketing teams would give 4 hours notice to put together a 50-page presentation. I work fast and efficiently, and I respond to every phone call and email. Most importantly, I design for my clients, not for myself. I really don't have a favorite piece I like to create. But my favorite thing about designing is the millions of solutions that can come out from one idea. I spent years working in corporate design where the colors and brand guidelines were strict. I wanted to create unique invitations based on the style, color, and decor elements each couple pulls together for their wedding day. Although, the initial interaction happens online with them telling me a bit about which stationery items they're looking for, it is followed by the consultation. I invite the couple to my studio to discuss their needs and ideas in more detail, we review paper and color samples, and if they don't already have an inspiration board for the wedding stationery, I create one so we can better understand bringing their ideas to life. It's a great jumping off point for the project! - Look at their past work and the quality of the materials they use. - Check that their style and vibe is a good fit for what you want to create. - Good wedding stationery experts should be able to answer your questions about timing and wording, as well as things you may not have thought of - for example, couples often overlook how the invitations will be addressed. Think of the stationery designer as the creator and planner for your stationery. - You should rely on them to help you navigate from the save-the-dates, invitations, and programs through to the thank you notes. - As with most successful relationships, communication from both parties is key. - And one last tip, have your guest list ready before asking for a quote. Stationery pricing is based on how many of each card you need, and this will save both you and your potential designer time. My mind is always flush with ideas immediately after the initial client meeting. We spend time talking about their style and venue. It's good to get to know them a little and listen to how they describe their wedding ideas. I often sketch a few initial concepts as soon as they leave the studio because I'm excited about the project! I like to get to know the couple and understand the style of the wedding they're hosting. 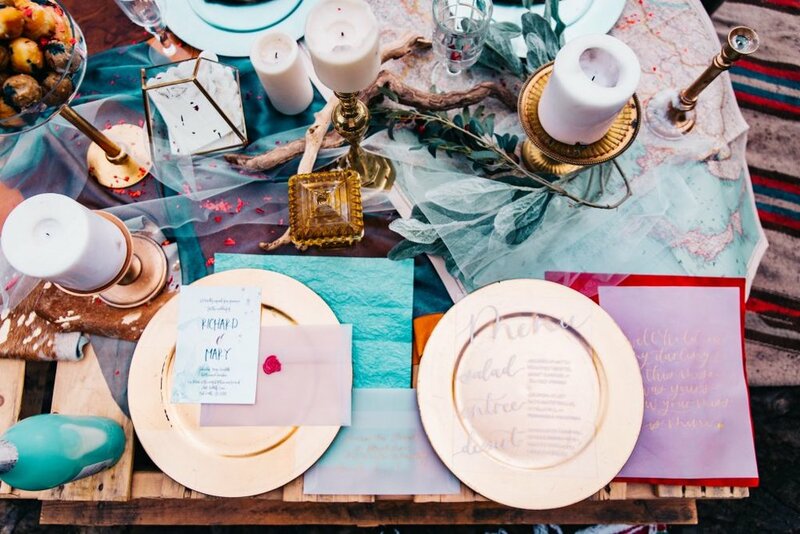 Inspiration boards like Pinterest often speak volumes about their wedding style. From there, I sketch several ideas and layouts. Once I have a couple of ideas I think are a good fit, I'll move to the computer to refine the designs before sharing the proof with the couple. The process generally takes 4-6 weeks. It can vary based on the complexity of the design, printing method, and if any special assembly or calligraphy is part of the project. It's always a good idea to start early to avoid feeling rushed at the end. It's about personalizing the experience for my client! I'm here to help them navigate the process, understand potential etiquette pitfalls, as well as create something that reflects the vibe of their special celebration. I love creating custom patterns for the wedding stationery. It's a fun way to push the style to another level and can be incorporated into different stationery cards in so many ways. When it comes to our favorite wedding stationery experts, it doesn't get any better than these two! Picking out your graphic designer can be fun and exciting, and seeing your ideas come to life is the prize after all the hard work. Share your wedding stationery ideas with us by using the social media buttons below and if you need more wedding invite tips, don't miss out on our blog about postage details!